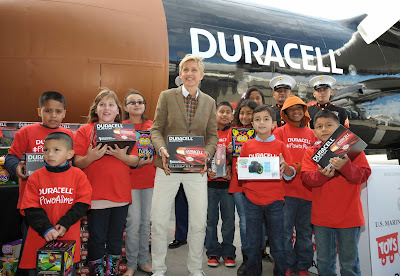 Charity Christmas daytime talk Duracell Ellen DeGeneres entertainment Holidays kids L.A.
Ellen DeGeneres, Toys for Tots Marines and local children celebrate the launch of the Duracell Power a Smile program that will donate up to 1 million batteries to Toys for Tots, triggered by the purchase of eligible Duracell Battery Packs. 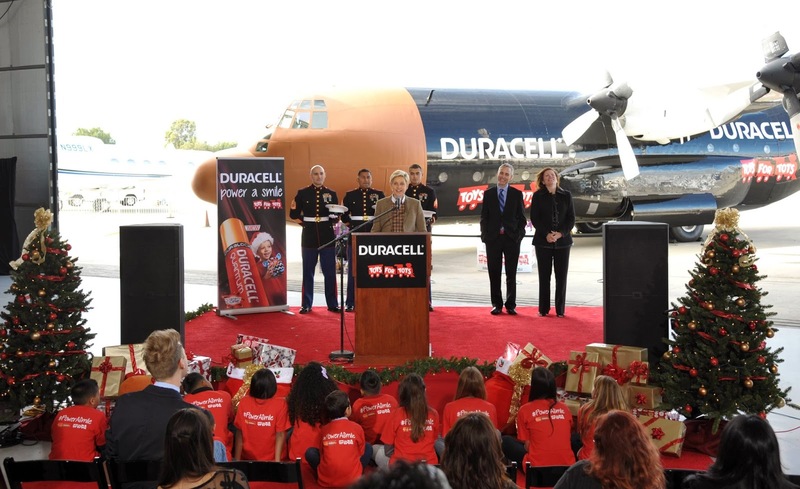 On Friday, November, 22nd Duracell launched its Power A Smile Program, which will donate up to 1 million batteries to Toys For Tots - the brands largest donation to the organization. Every eligible Duracell battery pack purchased will trigger a donation to Toys for Tots, which collects new toys to distribute to less fortunate children every holiday season. To launch the Duracell Power a Smile program, daytime talk show host and funny lady, Ellen DeGeneres joined Duracell and Toys for Tots at Van Nuys Airport in Los Angeles. DeGeneres, along with Marines conducting the Toys for Tots Campaign in L.A., helped prep a C-130 cargo aircraft with Duracell batteries and toys. The plane was symbolically sent to go forth and collect batteries and toys for children in need. Take a look at more photos below! "I love what Toys for Tots does," said Ellen DeGeneres. "But if you think about it, a toy without a battery on Christmas morning is so sad. It's like the ocean without the waves…or rain without the rainbow…or a strawberry without the daiquiri. I'm thrilled to join Duracell and to help bring a little extra joy to kids this season." 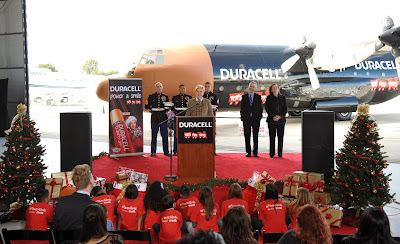 Ellen DeGeneres speaks to local L.A. children and the press about Duracell's Power a Smile Program with Toys for Tots Marines in from of a C-130 cargo aircraft which looked like one of Duracell's iconic batteries. "Toys for Tots is grateful for the support from both Duracell and Ellen as we start our work of collecting new toys from all over the country leading up to Christmas," said retired Marine Major Bill Grein, Vice President of the Marine Toys for Tots Foundation. "Batteries are a critical part of our program as they play a big role in creating a wonderful holiday experience for children in need." Here's how you guys and gals can help: To trigger a battery donation to Toys for Tots and stock up on batteries for the holidays, you can simply purchase an eligible Duracell Quantum or CopperTop battery pack at any major local retailer. Duracell will donate one battery for each Duracell Quantum AA 12 or CopperTop AA 16 pack purchased from now until December 27th. For more information visit www.duracell.com. Ellen has a soft spot for kids. Recently she sent Internet sensations Sophia Grace and Rosie to Britney Spears' rehearsal space to dance with the pop sensation and celebrate her upcoming December 2nd birthday. Check out the video below! Don't miss Queen Brintey on Ellen December 3rd! The Marine Toys for Tots Foundation relies on individual donations from the American public as well as support form corporate sponsors like Duracell. For more information, visit www.toysfortots.org. 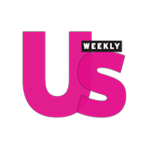 Charity, Christmas, daytime talk, Duracell, Ellen DeGeneres, entertainment, Holidays, kids, L.A.